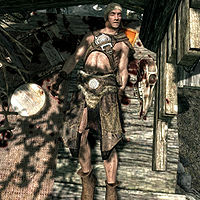 Lucky Lorenz is a dead Nord bandit who can be found inside his destroyed house, on the bank of the White River directly across from the Abandoned Prison. Contrary to his name, Lorenz was crushed by an ill-timed tree falling on him while he was sitting at the dinner table. His corpse contains a variety of loot, while Treasure Map IX and a copy of The Lusty Argonian Maid, v1 can be found near his body. There is a shrine of Dibella in the western corner of his shack, while the riverbank outside is strewn with various food items and ingredients fallen from a half-buried shelf. There is also a copy of the Light Armor skill book Rislav The Righteous to be found lying inside the shelf, and two wooden barrels containing more ingredients nearby. This page was last modified on 27 January 2016, at 03:35.